The on-going SACD series of orchestral works by Weinberg now explores some lesser-known, late works of the composer. This disc features the last two Chamber Symphonies, which indeed reflect a largely hidden, yet still prolific period of his life. The Helsingborg Symphony Orchestra, recording with Chandos for the first time, is conducted by the highly experienced and versatile Thord Svedlund. 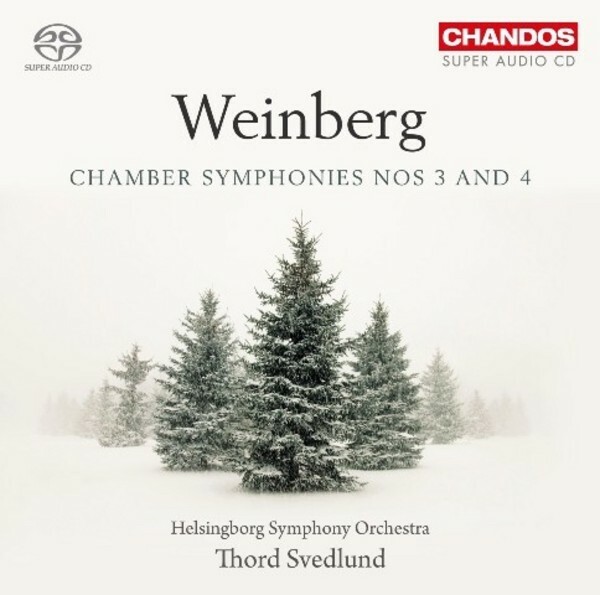 Not only is Chamber Symphony No.4 the penultimate work that Weinberg completed, but it can also be read as a summation of his entire life and oeuvre. The elegiac mood shaping the piece echoes his last decade � of infirmity, loss of friends to death and emigration, and gradual decline in public and professional interest in his work. Then each movement shares some reminiscences of Weinberg�s life: the placid strings weaving a delicate childlike lullaby; the opening chorale having already been used in some of Weinberg�s masterpieces; and the folk-like themes of the solo clarinet in the last two movements deriving from others. Apart from the sad, wistful last movement (Andantino) heralding No.4, Chamber Symphony No.3 is closely linked to String Quartet No.5, Op.27 through its recitative-like melody. At the same time, it perfectly justifies both the term �Chamber Symphony� and the orchestra here playing it: the Helsingborg Symphony Orchestra was founded in 1912, originally as a chamber orchestra, and now has claims to being one of the oldest in Sweden.